I'm off to the Mid Atlantic Nostalgia Convention in Maryland, running through this weekend. Will any of the rest of you be there? If so, I hope to run into you somewhere between the seminars and the vendors! In the meantime, here's a video about transportation, although not the kind we're using to get out to Maryland. This is about a car, and a show. The Edsel may have been a failure as a car, but it was a smash success as a television show. The Edsel Show, broadcast on October 13, 1957 in place of The Ed Sullivan Show, featured a cast of thousands - or at least Bing Crosby, Frank Sinatra, Louis Armstrong, Rosemary Clooney, and Lindsay Crosby (Bing's son) and the Four Preps. It was nominated for an Emmy as best program of the year, and was heaped with critical praise. It also hold a distinction that will become apparent with this video: it is the oldest videotaped program in existence. We're all used to watching kinescopes of old programs, but as the prologue to this video explains, videotape was just starting to be used as an alternative means to record and rebroadcast programs for use at a later time. I think you'll see how striking the difference is between kinescope and video tape by the examples that precede the program. I just happened to stumble across this the other day - I've actually got a copy of the kinescope version - and this really makes you feel as if you're seeing the program live, as it was originally broadcast. It's another great piece of our television heritage - thanks, Kris Trexler! This aired a little over a month after the Edsel debuted...what was the feedback on the car and sales figures by that time? 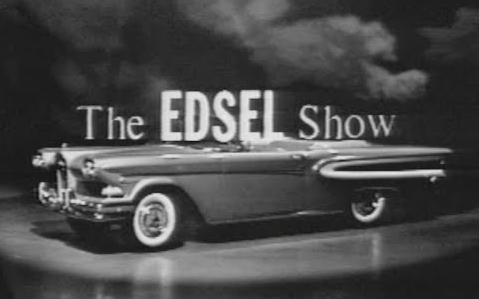 The Edsel Show aired in the Ed Sullivan timeslot on Sun night (8:00 ET). However it was not played back on a three-hour delay on the west coast, but on a four-hour delay. The show was done LIVE! from 4-5 PM PST to reach the east coast from 8-9 PM EDT. From 1955 through 1961, Cali still returned to standard time at the end of Sep, while NYC (and Chicago, among other places) extended DST until the end of Oct, resulting in a four-hour time difference during (basically) Oct, between NYC and L.A. He has lots of other nice stories that he shares every month or so. Although it apparently no longer exists on videotape, the first videotaped program was the October 29th, 1956 "CBS Evening News", anchored by Douglas Edwards. I've heard an urban legend that this broadcast actually ran 20 minutes, instead of the usual 15 minutes, because the first news bulletin about the outbreak of the Suez War supposedly moved on the news wires while Edwards' newscast was on the air.